...to see a pair of earrings I made in a photo Brigid took for her post on Storing Valuable Things. 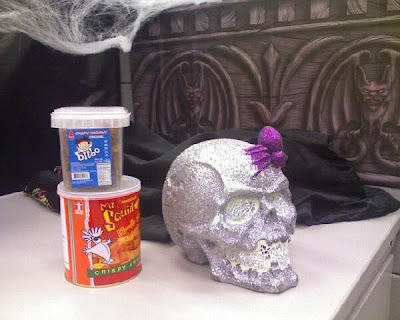 Oh, and here's my disco mirror skull and the squid and anchovy snack treats from my cube. My co-workers politely declined my offer of baked squid product snacks-- they perhaps did not wish to appear too greedy. 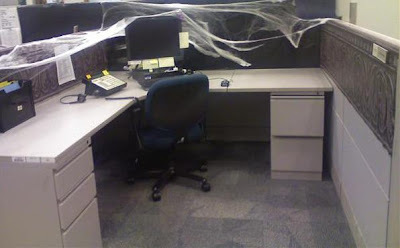 ...but today my cube is decorated for the season, and when I get to work, I'll put out my be-glittered skull. I denuded the desk of the usual flotsam and jetsam, but there remains a few post-its. Post-its of death! Cube of terror! Halloweeny. Good times. Tried on my wig last night, and it looks plenty hot. 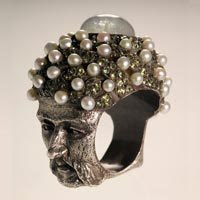 The exquisite jewelry of Turk Sevan Bicakci has ever been droolworthy. All one-of-a-kinds, his lapidary work is nothing short of astonishing, with intricate carvings from the underside, as pictured below. A handful of his pieces are available at Barneys New York. I have somehow been roped into being a goth marionette along with the women in the two neighboring cubes. What do you think of the black lipstick mixed with Dior's liquid vinyl? Comment from the peanut gallery was "very Elvira." Friday is dress-up day. This is the first time in many years I've felt remotely inclined to dress for Halloween. Should be fun. Mr. Horsefry was a youngish man, not simply running to fat, but vaulting, leaping, and diving toward obesity. He had acquired, at thirty, an impressive selection of chins, and now they wobbled with angry pride. He balled his tiny fists and shook them impotently skyward. A place I used to work operated more like a dysfunctional family than a workplace. I had a bit of autonomy and played SWMBO in the main, so I shrugged off a lot of boobery on the part of certain other folk with whom it was my lot to work. Some things were more easily shrugged off than others. The company owner was a fit-thrower. Things could be rather random, actually, and he didn't rave frequently or I would have hied me elsewhere for a paycheck. Still, when he clouded over, he could be a right nasty piece of work. Such events were infrequent enough and he wisely never ranted at me in my presence, so, whatever. One day, though, he threw a right strop. Incandescent with rage, he spat and cursed from the other room. Generally, I'd leave him to it, but this day he fumed and ranted and raved on in a not-so gentle crescendo of vitriol which peaked fairly spectacularly in a resounding kick to a perfectly innocent by-stand ing filing cabinet. When I think of that day, I always imagine him balling up his tiny fists and shaking them skyward, awash on crashing waves of the cruelest of fates-- something in the world he could not fold, spindle or manipulate to bend to his megalomaniacal will. What could it be? As I said, my custom is to not give attention to fit throwers. While they may richly deserve a proper beating, mine is not the place in the universe to dispense justice-- woe betide them if I were... However, this day, the doo-doo hissy was protracted to such degree as would not be ignored. My phone calls were being interrupted. Business-- dysfunctional or no-- would not be conducted as per usual. Something™ had to be done. I resolutely marched into his office and said "may I help you?" Pointing at his laptop screen, he muttered and grumbled that he couldn't get "that damned thing to go away." 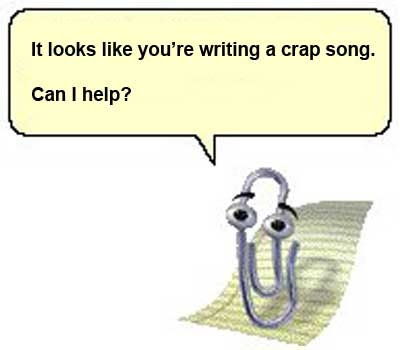 I looked at the screen and saw a perfectly innocent little paperclip looking out eagerly, innocently blinking and longing to be of assistance. I'd never even seen the damned thing before, and I poked around for about 30 seconds and got it turned off. "There you go" I said and flounced out of his office and back to work, never missing a beat. It was yet another of those moments when I had to dig my nails into my palms and contemplate dead puppies and the ripping-out of nosehairs to govern my giggle urge. He'd finally found something more obtuse, bull-headed and senseless than himself-- a match made in heaven. November 17 Immi'll be playing the Granada Theatre on Lower Greenville in Dallas. I've got my ticket already. *JOY! * To top that off, I'll have two of my favorite people on the planet with me in the form of my sister and my niece. Sis and I have always both been music enthusiasts and have attended many concerts together, and this will be the first time niece is joining us. Fortunately, this show is age 10 and up, so it should be a pretty mild crowd. Here's a link to her North American tour dates with ticket information. Go see Imogen Heap if humanly possible. Sunday, Puppy Sunday: intruder alert. Praline was very wound-up and fretsome over an intruder last weekend. 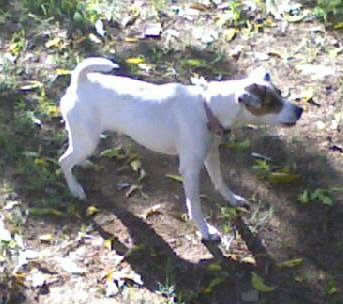 I had to pop into the back yard to see what had her so agitated. 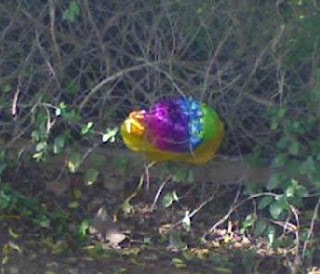 The wind was blowing and its helium had not quite gone all off, so this mylar balloon bobbed gently at the base of the fence, taunting one Jack Rascal. 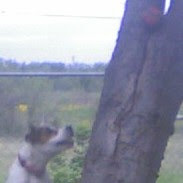 Both pups were leery of the balloon, but while Praline barked her brains out, Chuy growled steadily. When they finally got hold of the balloon, they mercifully dispatched the poor thing forthwith, not prolonging the suffering, and all. After the initial deflation, I got the balloon and string away from them so they wouldn't choke, but for a few minutes it was wild times. It's nice how dogs remind us to see the excitement in banal and silly things. Bless 'em! So Thursday a dear companion was under the weather and I happened into a coworker at the local grocers'. She invited me over for dinner with she and several others, and I accepted. I had a lovely time, but little did I know as I left her place that the best was yet to come. Her place was a goodly distance from my house, and I set out from there, following the instructions to turn left, even though right felt the proper way to go. 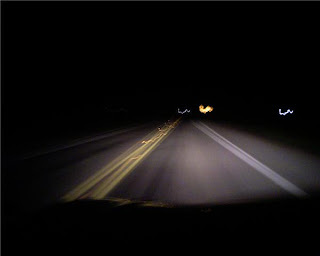 Soon I was driving down a lonely Texas highway in the dark of night, chatting on the phone to my dad about evasive driving should feral hogs cross my path. Suddenly the signal dropped and I was alone in the dark with about a hundred miles of open range to the west and to the east the middling city's lights reflected on low clouds. This was the most desolate moment since I've been out here. I thought of nights driving through Dallas and feeling like I owned it, slick and new and concrete, and sparkling with diamond lights. This night I felt like desolate west Texas owned me, instead, with its spotty blessings of dropped signals and wild bacon on the trotter. Did you know Ms. Albright has a new book out on her clever use of brooches to make pointed statements in the international arena? It would never have happened if not for Saddam Hussein. When U.S. ambassador to the United Nations Madeleine Albright criticized the dictator, his poet in residence responded by calling her "an unparalleled serpent." Shortly thereafter, while preparing to meet with Iraqi officials, Albright pondered: What to wear? She decided to make a diplomatic statement by choosing a snake pin. Although her method of communication was new, her message was as old as the American Revolution—Don't Tread on Me. What??? Hussein was a dictator? Who knew? If Condi Rice wrote one on footwear, well, I might bite, but methinks this one's a bit of a stretch. This is amazingly cute. It goes to 11, in fact. I was watching how the hummingbird looks around more time than it spends slurping up the nectar. Then I thought again-- he finally lights on the palm of a big monser! EWWWW! Scary! Courtesy Flush and other housekeeping notes. I may have mentioned at some point that I'm working in Customer Service these days. That's right. From the minute I hit the old time clock until that last second of the day, I'm straining doorward at the end of my phone-tether, professional palaver maven. I service members all day long. I understand my role and in a lot of ways I enjoy what I'm doing. I'm a fixer. I enjoy solving puzzles, and I find it tremendously gratifying to make things right for folks. 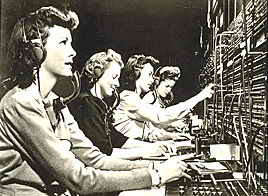 Howe ver, if folks are calling in to customer service lines, there are a few things they can do to help me do my job. Squalling infants in the background: You may be baffled to know that the poo-flinging dauphin wot sprang from your loins is ear-piercing over a phone line. I can't solve your problem if your voice is a mere whisper behind the 80 decibel wall of cacophony your child is orchestrating. Please please pretty please put a cork in it before you call, mkay? We're talking and I'm focusing on your issue. I take this very seriously. Hearing your jeans unzip plays havoc with my ability to concentrate on resolving issues. Trying to keep the laughter out of my voice against the backdrop of your clattering urine reporting around a tiled room is, well, it's just embarrassing. And THEN you flush. Well, makes sense-- it's not as if you would like to discreetly hide what you were doing. How about a courtesy not-flush in this case? At least I could pretend you were folding laundry and then washed your hands in a sink? Help me with my fantasy, okay? Loud tv/video game/electronic equipment in the background: would you mind terribly powering down the table saw before you call? I really want to help. Help me help you. Chuy's paw prints came off the wall mostly with a wet warsh cloth. The other little bit was easily touched up. I'm prolly moving into my new bedroom this week, depending. WOOHOO! 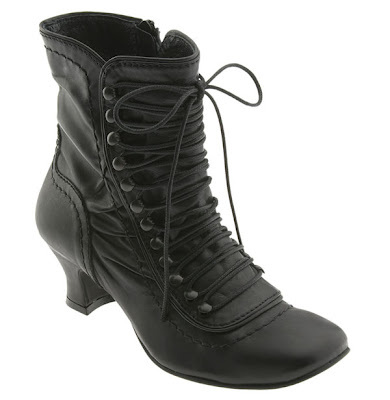 These little boots are calling to my inner steampunkette. Sunday, Puppy Sunday: These are not the paw prints you're looking for. I would never smear muddy paws on your freshly painted wall. I'm too sweet and innocent and intense and sincere. See my wrinkles? Innocent! Honestly, I can't think of a single person who would do something so thoughtless and careless. Well, maybe Praline would, but I would never. You've gotta hand it to couch potatoes: they know their limits. They're not going to break their leg hiking in the badlands of South Dakota and have to saw their own paw off with a Leatherman to get to help. They won't die in Class IV rapids when their canoe goes all tippy. They won't be borne aloft by a ski kite in a blizzard on a mountainside in Algiers. This is a friend's ceiling. Stone cold sober, it always makes me feel hung over. And here's a puppeh photo from the room painting. He's such a good little helper, is Chuy. One day Grandma Bertie came to stay with me and my brother while Mom was at the hospital. It was a Monday. Tuesday morning, Bertie was cooking us breakfast. Having installed a wider sink in the counter the year before, Dad had removed the guts of one of the drawers and nailed it back on the front of the cabinet to accommodate the sink's wider proportions. Bertie asked Dad where she'd find a spatula, and he rather absently pulled open a drawer or two, and then handily pulled the false front plumb off the cabinet, to peals of giggles from me and big brother. He stared at it for a second, then broke into his usual mega-watt smile as Bertie dissolved into paroxyms of knee-slapping laughter. Bertie and I laughed over that many times over the years. It was a great memory of a moment alive with possiblity and wonderful prospect. I suppose Dad was a little distracted, just then. That was a strange day, waiting for Mom and the baby bundle to come home. When we'd go to the store, people would coo at the pretty, perfect little baby in the carrier in the shopping basket. More than one person asked if she was a doll. Her own babies have been a glorious reminder of how pretty she was. I'm not biased at all-- she really was that pretty and still is. Mom was adamant that there not be pets in the house. Fine, Blowfuzzy said-- she'd get her own pet. 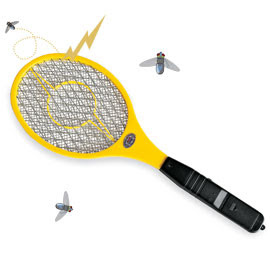 She began carrying a dead housefly around in a shoebox, calling it Fred. (yep-- we're related.) Fred went to church with Blowfuzzy and on family roadtrips and the like. Blowfuzzy talked to Fred. Mom finally caved in and Blowfuzzy got a puppy. No one pushes Mom's buttons like Blowfuzzy. Then again, Blowfuzzy pushes everyone's buttons. Wow. Has it really been 35 years since you were born? I wished and I wished. When I was a little girl, I thought having a little sister would be the best thing ever, would make life so much better. Privacy, disclosure and your health insurance. Did you know that if you are on a health insurance policy with your spouse, your insurance company can no longer disclose information regarding your spouse's claims to you, deductibles or other cumulative data? You may sidestep this by taking the precautionary step of submitting some form of standard authorization form to your health insurance company. The idea behind all this is that under terms of HIPAA regulations, everyone's privacy will be protected. It seems to me this could cause tremendously confusing situations when one spouse is incapacitated in hospital, ratcheting up stress levels for the one who remains whole and is trying to cobble together a plan of action. I believe the default setting should be that people who want to withhold such information from their partners should bear the burden of notifying their health care providers not to disclose such information, but noooooooo. There has to be all this regulation to punish the kids who weren't acting up. It's all quite tedious, really. Anyway, this is by way of a public service announcement. I had for my last several years in Dallas posted photos quite frequently on Dallas Diorama. I had a goal of daily photos, but generally fell short. I put quite a few nice photos up, though, and it was fun. Lately, I still I get comments which must be spam. They are generally in kanji, katakana and hiragana. No doubt, they promise to enlarge my manhood in various languages I do not speak. Early evening, downtown at the west end of Commerce, which is a one-way street. I moderate the comments on my blogs so people don't have to do the word verification. Sunday evening someone left a comment there and I nearly deleted it without even reading it, out of habit. Quite. I'm quite happy to be living well away from that particular set of weirdness. Miss Praline makes like a squirrel as she watches the ball fall from the tree, having just dislodged it from where a pesky human wedged it. 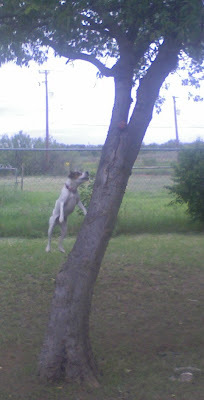 She runs right up the tree, nips at the ball and then gracefully descends in the form you see above. Note how she never loses focus on the ball. Either she's really smart, or completely insane. Or mebbe she's both. She is officially adorable, though, and mostly she's a very good little girl. So I'm painting the ceiling in my soon-to-be bedroom. I've not got a paint-plop in my eye, but I did have a touch-and-go on an eyelash when I was doing the kilz last week. What I'm wondering is if Leonardo da Vinci was such a braniac and all that-- designing helioclopters and whatnot, and an artist as well, why didn't he invent safety goggles? I mean, I know there was a decided lack of plastics in that era, but they def. had glass. I'm just saying. Uncle Oswald: "Hey mate-- you paint, right? How's about you help me paint the salon?" Picasso: "You'd like a fresco, perhaps? A frieze?" Uncle Oswald: "Ew! No! Eunice wants beige." They prolly came to cringe hearing the phrase "you paint, right?" Sort of the percursor version of "I'm moving-- hey!!! Is that your truck?" * 'tis perhaps the fumes. Yes. Spelt it that way on porpoise. I am not surprised Obama was awarded a Nobel Prize. I am surprised it's happened so soon. I'm thinking there was a slight pity-motivator considering the whole Olympics-fail occurrence. Then again, after Al Gore got it, what was left to respect, anyhoo? Here's something altogether more respectable from the folks who dole out the Ig Nobel Prizes: Luxuriant Flowing Hair Club For Scientists™. I got a giggle out of this. I got up a leetle early and it was raining and dreary-- my favorite. My paycheck had already been deposited early when I checked my account first thing. Walked into the saltmine to find someone had festooned my cubicle with party streamers and a "happy birthday" swag. Someone brought cake and there were birthday cards. My boss called and sang happy birthday to me. I to ld her I'd like it better if she came to my cubicle and breathily sang "happy birthday, mr. president" whilst trying to put my eyes out with sequins a-poppin'. She played along. It was fun. On the phones, no one cussed me out, acted like a jerk or hung up on me. At some point in the day, I had an enormous epiphany-- something I knew would set many things to right. It was brilliant and simple. I couldn't wait to tell someone about it. Then I forgot it. But for a moment, it was be-yoo-ti-ful. I showed off my earrings and the picture on my phone of teh puppehs got up in vinyl boots. 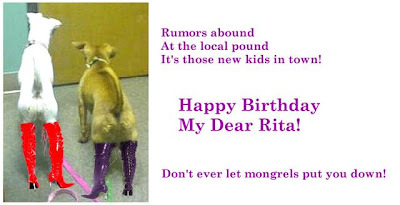 Lots of friends called and said happy birthday. Lots of folks said so here and on Facebook and in email. Holly even sang Happy Birthday on my voicemail. After work I went for a drink with 5 coworkers. It was really sweet. We laughed and cut up. Some of the folks I work with now are some of the best people I've ever worked with-- I hope we'll stay friends. Mom and Dad called and told me they love me. Mom said it was a beautiful day when I came into their lives. That was very sweet. My college transcript arrived in the mail-- have been waiting for that for a very important reason. Then on to a restaurant for dinner with more dear ones and then home to teh puppehs who were happy to see me just because. It's nice to have a day when everything seems to go very right. It's really nice when that day happens to be your birthday. 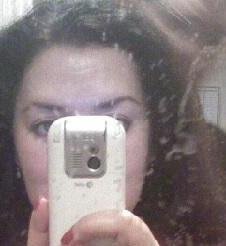 ** No, that's not toofpaste splatters on the mirror. It's just old and scratched up. Pinkie swear. Peter had quadruple bypass this morning and is in recovery and resting. I'm going to be a lot happier when he's well on the mend and back home again. Bless you, Peter. You are ever present in our thoughts. and sending warm thoughts to my friend Peter. Once upon a time before triple-threat showmanship was dead, you could see folks like Johnny Carson and Pearl Bailey toss out a floor show and bring down the house. At one point Pearl ooches over the piano player and takes up the supporting instrument without missing a beat. Not bad for a lady who was singing before they invented electricity. What a set of pipes. That dress is fabulous, too. Watch for Johnny's faux striptease. Rich, golden stuff. The fine folks at Cydwoq are making some shoes that blow my tiny little mind. Though their heels aren't up to my usual stratospheric standard, these are shoes I could get into wearing, as they smack of steampunkery and old-world craftsmanship in the most delightful way. For example, this gold metallic pair is drop-dead adorable, in my humble opinion. The harlequin Victorian boot makes my heart go pitter-pat. These also sound like they are the sort of shoes which actually improve with wear, rather than the usual opposite. Stunning. Once I'm settled in a permanent position for work and monies, well, we'll definitely keep this cobbler on my short list. 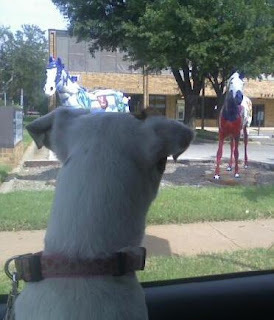 Miss Praline was generally calm and content on the way to the vet's office, until she took personal umbrage at these two gaily painted horses in front of a business in town. Such a challenge could not go unanswered, and Prailine huffed and growled to beat the band. If only she could have gotten at them, she totally would have kicked some big horsie statue a ss. I had a bit of difficulty finding a vet still open on Saturday. I arrived at 11:30 to one I'd been told about, but they closed at 11:30 rather than 1:00, as I'd thought. meh. To my surprise, I found the vet I'd taken Chuy to after his rattlesnake bite in May was open, so I hied us over there. We were ushered into an examination room where they left us alone for a bit. The pups stood at the door wondering where the nice lady went. 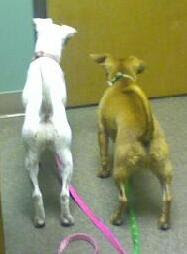 Then they took Praline to another room for a blood sample and Chuy wondered where big Sissie had gone. Then they brought her back and she stood and wondered where ickle bruvva had gone. Chuy only needed his rattlesnake vaccine and bordatella, not being due for shots until December, and Miss Praline got the full battery of annual shots. Chuy stood like a man and was fine. I didn't know they had an injectible bordatella shot now - thought they were alwas a nasal thin gie? 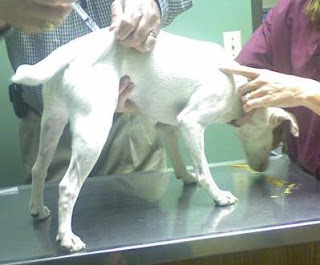 Anyway, since Praline had 4 shots to do, the vet whipped out a can of cheez-whiz and said "since you're such an active thing, I'm going to give you something to do here" and squirted a long squiggle on the table top. A spoonful of cheezwhiz makes the medicine go down. Going to the vet in nearby city today to get Praline's shots, Chuy's first rattlesnake vaccine and bordello treatment for the both of 'em. They haven't been in a car together in months. I expect it'll be wild. PUPDATE: They had their moments, but wild they were not. The little things charmed everyone as they walked in tandem, synchronized tails like windshield wipers. More pictures tomorry for puppy Sunday. It's the tail-end of the week, and I'm ever-so-pleased. 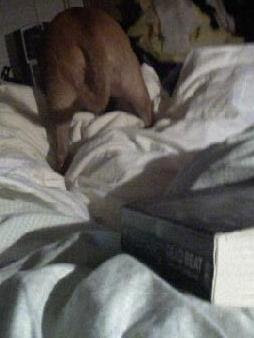 Here's Chuy's marvelous caboose, high-tailing it under the covers. This week, someone scooped me on how the place I'm working is a hotbed of bisexual lesbanese intrigue. And there I'm missing it by focusing on trying to do a good job. Lordy, what a dullard I be! Anyhoo, SOOOO glad it's Friday. Want this more than any pair of shoes I can think of, but this, too, shall pass. 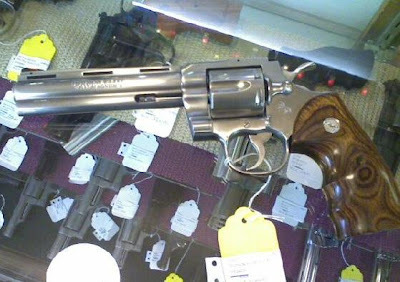 Had a slobber-fest over this and the other two Pythons at Ray's Sporting Goods last Saturday, but this was the best one. This felt great in my hands. Yum. It wouldn't be of questionable taste to point out my own good taste, would it? Good. I thought not. But any money in the budget now is for more practical things, although what could be more practical than this?